Downloads for Nexon’s new high-end mobile game, “Traha,” began Wednesday on Google Play and the App Store. Gamers can officially start playing Thursday, but Nexon decided to allow app downloads a day earlier to cut down on rush traffic. “Traha,” serviced by Nexon and developed by Moai Games, is welcomed with much anticipation by industry watchers, who expect it to become a hit with an in-game domain 16 times the area of the Seoul financial district of Yeouido, and with graphics “unrivaled” in clarity. “Traha” first garnered attention in November 2018, when it was introduced at the Global Game Exhibition G-STAR in Busan. Despite the number of servers prepared for the occasion -- double the usual -- the incredible volume of traffic, consisting of more than 4.1 million users, was affecting download speeds as of Wednesday morning. “Traha” requires 4.5 to 5 gigabytes of memory. This mobile massively multiplayer online role playing game is most compatible with the iPhone 6S and Galaxy S7 or higher models. A 5G network is ideal. Nexon’s partner telecom company, KT, said it would reward 300,000 clients for downloading “Traha” between Friday and Tuesday by randomly gifting them with 5 GB of data, 100,000 gold pieces and 200 health potions. Rather than spend actual money, players will have to play minigames within “Traha” such as fishing, cooking, crafting, horticulture and blacksmithing to earn gold. Gold is what players use to create weapons in order to participate in the great war between the Vulcans and the Naiads. There are six types of weapons -- a one-handed sword, a set of two-handed swords, a staff, a shield, a bow and a knuckle duster. A combination of three weapons creates an “Infinity Class” character, or one with a customized skill set. 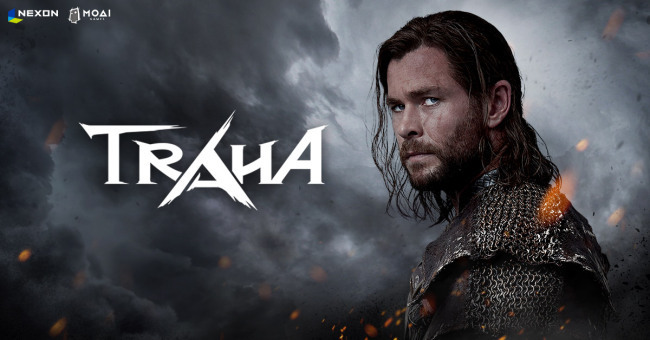 The game title, “Traha,” refers to a hero in this game world. Chris Hemsworth, who plays the thunder god Thor in Marvel’s “Avengers” movie, is the face of the game. A global launch date has yet to be announced. “Traha” was developed by Moai Games using Unreal Engine 4. It is published by Nexon, which has plans to release nine more mobile games in the first half of 2019.